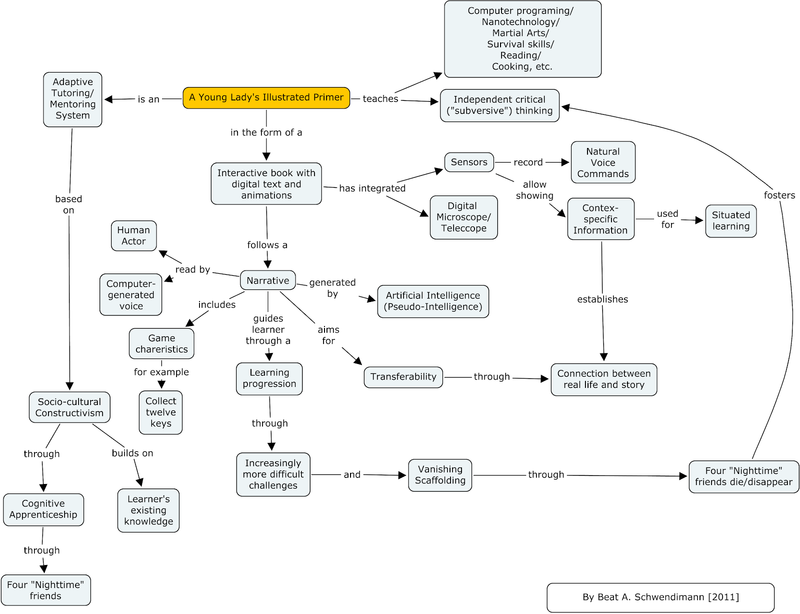 Proto-Knowledge: Building "A Young Lady's Illustrated Primer"
Building "A Young Lady's Illustrated Primer"
Neil Stephenson's book "The Diamond Age" presents a fascinating piece of educational technology called "A Young Lady's Illustrated Primer" (See diagram below). The primer is an interactive book that can answer a learner's questions (spoken in natural language), teach through allegories that incorporate elements of the learner's environment, and presents contextual just-in-time information. The primer includes sensors that monitor the learner's actions and provide feedback. The learner is in a cognitive apprenticeship with the book: The primer models a certain skill (through allegorical fairy tale characters) which the learner then imitates in real life. The primer follows a learning progression with increasingly more complex tasks. The educational goals of the primer are humanist: To support the learner to become a strong and independently thinking person. Currently, educational technology has early examples of adaptive tutoring systems. However, an artificial (pseudo-) intelligence that can mentor a learner in real-life complex problems is still far away. For example, the IBM Watson computer can understand natural spoken language and give simple answers. Educational toy company LeapFrog developed the LeapPad - a tablet computer for children that resembles the "Young Lady's Illustrated Primer" - except for the goal of subversive critical thinking. Another example, the teaching software for the One-Laptop-Per-Child (OLPC) wis directly inspired by the "Young Lady's Illustrated Primer". It is even named "Nell" (after the main protagonist in the novel). Miles from the nearest school, a young Ethiopian girl named Rahel turns on her new tablet computer. The solar powered machine speaks to her: "Hello! Would you like to hear a story?" She nods and listens to a story about a princess. Later, when the girl has learned a little more, she will tell the machine that the princess is named "Rahel" like she is and that she likes to wear blue--but for now the green book draws pictures of the unnamed Princess for her and asks her to trace shapes on the screen. "R is for Run. Can you trace the R?" As she traces the R, it comes to life and gallops across the screen. "Run starts with R. Roger the R runs across the Red Rug. Roger has a dog named Rover." Rover barks: "Ruﬀ! Ruﬀ!" The Princess asks, "Can you ﬁnd something Red?" and Rahel uses the camera to photograph a berry on a nearby bush. "Good work! I see a little red here. Can you ﬁnd something big and red?" As Rahel grows, the book asks her to trace not just letters, but whole words. The book's responses are written on the screen as it speaks them, and eventually she doesn't need to leave the sound on all the time. Soon Rahel can write complete sentences in her special book, and sometimes the Princess will respond to them. New stories teach her about music (she unlocks a dungeon door by playing certain tunes) and programming with blocks (Princess Rahel helps a not very-bright turtle to draw diﬀerent shapes). Rahel writes her own stories about the Princess, which she shares with her friends. The book tells her that she is very good at music, and her lessons begin to encourage her to invent silly songs about what she's learning. An older Rahel learns that the block language she used to talk with the turtle is also used to write all the software running inside her special book. Rahel uses the blocks to write a new sort of rhythm game. Her younger brother has just received his own green book, and Rahel writes him a story which uses her rhythm game to help him learn to count. [Source: http://dvice.com/archives/2012/10/ethiopian-kids.php] Read more in this paper. Love your blog. I have had exactly this thought from the moment I first wiki'd the Stevenson book. This concept is key: revolutionizing education by creating an app that can form fit to a kid from birth to help bring them the knowledge, skills, and habits required to be successful, happy, and good people. I read The Diamond Age some years before the IPad. Good stuff. Turning a tablet pc into "primer" is something that is close at hand but (and its a BIG but!) i'd be remiss not to point out that Dr. William Ayers (look it up) is a Doctor of *education*. This might be a problem. I read "The Diamond Age" well over a decade before the iPad. What does Dr. Ayers have to do with anything? He's not mentioned in the book, on this page, and is not part of the OLPC or Leappad projects. I remember seeing something like the Primer in JJAbrams' new Star Trek where Spock was being grilled on astrophysics or something. The teacher just wandering around the students' 'tutor pits', doling out discipline and moral correction. I knew when I saw it that it was the Primer and I wanted to build it... unfortunately teaching takes absolutely hours every week! I just stumbled across this article while researching the prospects for building an artifact akin to the Primer. Have you done any further work on this topic, or can you recommend related papers / works on the subject? Anything's greatly appreciated. Thank you for your interest. 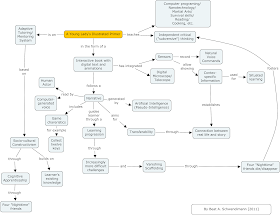 There has been a lot of work in the area of 'intelligent tutoring systems', for example to teach students mathematics or computer languages. These systems work reasonably well for narrowly defined areas of knowledge with clear 'correct/false' analysis to which the system can react. However, there are no such systems to support areas like creative writing. I realize this post is ancient by net standards, but awesome has no expiration date and Diamond Age continues to colonize my mind with some regularity. I was wondering about the way the various recipients of the Primer turned out so different from each other. Fiona lives in a fantasy world, due to her father doing much of the racting for free. Elizabeth - the one the book was created to 'subvert' her away from a life of hypocrisy - rejected both the subversion *and* the hypocrisy. Nell, who started out most like a blank slate, became the most self-actualized person in the book. But a quarter million Han daughters also had the Primer, and none of them turned out like Nell. They became the 'Mouse Army', and the stories the Primer told them were focused on finding and helping their mysterious missing Queen. So why did the original three copies create three fiercely idiosyncratic characters, but the following quarter million copies create an army of people who would eventually pledge fealty to Nell, after spending *their* time with the Primer going on quests to find Nell, unlike Nell's quests which sought to sharpen her mind and body to be ready for greatness. “Then part of your responsibility will be to make alterations in the Primer so that it is suitable for our requirements...” Judge Fang said. In the original three copies "the education is there, but it's darker... lots of unreconstructed Grimm Brothers content." The raw stuff of fables, continuously adapting to the reader through the help of systems like those in your diagram and, in the case of two of the books, voice ractors who had a personal interest in the well-being of the reader. But Hackworth - his name itself being both clue and typically Stephensonian pun - changed the Primer when he made the copies for Judge Fang. So... how do *you* think those changes were accomplished? Looking at your diagram, it is possible that the mechanism for this was in the "Socio-cultural Constructivism" block. But the ideological key seems, to me, to be a change in the "Independent critical ('subversive') thinking" block. Lord Finkle-McGraw wanted the Primer to *subvert* Elizabeth, to develop her critical thinking skills enough to save her from a life of hypocrisy. Hackworth's 'trick' decoupled subversion from critical thinking... he wanted not to *subvert* the Mouse Army, but to *stabilize* them. His reasons for doing this were not clear to us, because they were not clear to Hackworth. But his 'trick' turned out to be exactly what Dr X and Judge Fang wanted him to do; by the time Hackworth fouund the Alchemist, the Mouse Army had found Nell, who was using ideas from her Primer - and, perhaps, Hackworth's skill as Artifex, abstracted through the Primer's dreamspace - to create Seed technology that could change everything. And to find Miranda, making this the only Stephenson book that has made me cry.